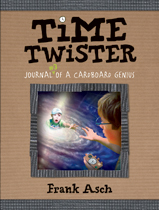 Time Twister: Journal #3 of a Cardboard Genius, Frank Asch, (2008, 144 pages) is a very simple story, well told. Frank Asch is better known for his picture books, including the Moonbear series. I have a quarrel with Frank Asch, however, which is that this third book in the series ends with an obvious cliffhanger, yet he never wrote a #4, according to the publisher’s website. In Time Twister, Alex makes a time machine out of a cardboard box. He plans to travel in with his best friend Zoe, and his little brother Jonathan. Alex does the first time machine test on his younger brother. There are some glitches with the machine. He tries to send Jonathan back five minutes in time, but actually sends him back about five years. He and Zoe then have to come up with an explanation of where the baby came from, and restore Jonathan to his normal age. They fix that problem, but then the machine rips a hole in the space-time continuum that starts sucking everything into it. The boys have to destroy the machine to avoid a catastrophe. What I found most interesting about this book however, wasn’t the characters’ time travel which was minimal, but rather the trio’s newly found ability to see other time travelers. The three make “time goggles” out of old glasses and two toilet paper tubes that allow them to see these people from other times. They discover time travelers are all over the place invisible without the time goggles. At one point, they even get to look at the contents of the purse of a woman from the future, which was fun. This was a light, quick read, suitable for younger middle grade readers, perhaps Time Warp Trio fans. The main character wasn’t particularly likeable. I couldn’t figure out why he hated his younger brother so much, although I have observed that younger brothers can be annoying. But this book had some fun action. Black and white drawings added to the appeal. This entry was posted in Book reviews and tagged Frank Asch, kids' time travel stories, middle grade fiction, time machine, time travel books for children, Time Twister. Bookmark the permalink. Thanks for the recommend. I’m familiar with his picture books, but not this series. Ack on the cliffhanger and no book 4! I like the goggle that they made to be able to see other time travelers. How cool! Stinks about the cliffhanger and no book 4. Maybe it will come out soon?? ?